Electrical Cylinders Can Revolutionise Your Productivity. Join us in Blackburn to See How. Are you fed up with traditional, inefficient pneumatic cylinders? Maybe you have heard that electrical alternatives could make a big difference to your production processes? Well, it's true! Our customers often complain their pneumatic cyclinders are unreliable, hard to control and expensive to run, but don't know enough about the alternatives to make the switch. IAI electrical cylinders offer accuracy, speed control and repeatable positioning that you simply can't acheive with pneumatic alternatives. They are also easy to control and adjust, are easier to maintain and are more reliable. 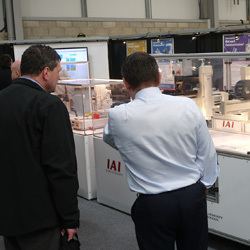 For three days only, we are bringing a series of working IAI demonstration rigs from Germany to show how different electrical cylinders could Revoltionise Your Productivity. No boring presentations, no set times and no fixed agenda - you can stay for 20 minutes or a couple of hours. It really is up to you. LC Automation motion control experts and technical support engineers will be available each day to discuss your applications, our range of electrical actuators, and how we can help to integrate them with your production process. We don't have a fixed time for this event (our experts will be available between 9am and 4pm on all three days). However, we would like to know if you are coming, so we can ensure that our demonstration area doesn't get too busy and you get the attention you need from our experts. Just reserve a place using the form on the right.